Ammann's modular, easy-load ballasting system enables the machine weight to be adjusted from 9 tonnes to 28 tonnes in a single hour with the help of only a forklift. The Ammann ART 280 Hydrostatic Tired Roller is available with engines that meet varied emissions levels. The compactor performs well on both asphalt and soil. Applications include motorways, railways, airfields, industrial zones and residential areas. Ammann's modular, easy-load ballasting system enables the machine weight to be adjusted from 9 tonnes to 28 tonnes in a single hour with the help of only a forklift. This translates into a load-per-tire adjustment from 1.125 kg to 3.500 kg. The ease and weight of the ballast adjustment are unique to the market. The system enables use of varied ballasting materials including water, steel, concrete and sand. The air-on-the-run system allows easy control of tire pressure from the cab. 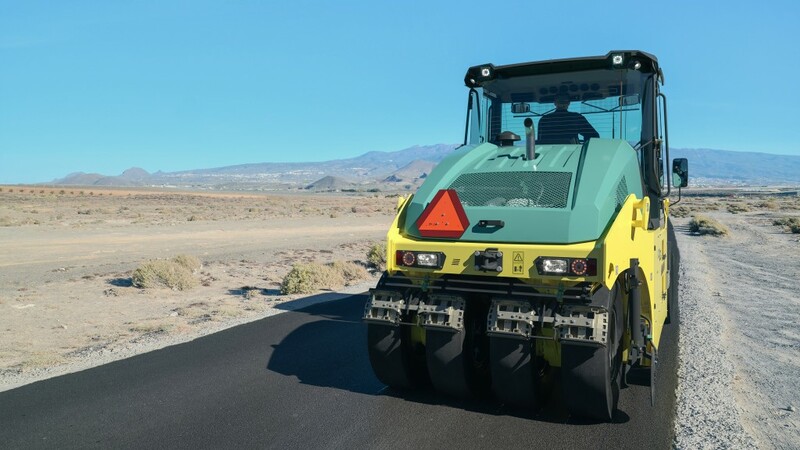 The ballast adjustment and air-on-the-run system make it easy for the operator to control machine weight and tire pressure, the two main tired roller compaction factors. Front isostatic axles with oscillation offer higher stability and increased surface coverage and quality. Front tires are connected with an isostatic system that enables movement of +/- 50 mm. The front-axle configuration combines with +/- 3° oscillation for optimal tire contact in difficult terrain. The new cabin is spacious with low sound levels and a 170º rotating seat for all-day operator comfort. A multifunctional display provides intuitive control, ensuring even less experienced operators are successful. The cab offers optimal sight lines and visibility. The roller is powered by the latest U.S. EPA Tier 4F/EU Stage 4 engine from Deutz with EGR, DOC and SCR technology. In less regulated countries, the compactor features a U.S. EPA Tier 3/EU Stage 3A Deutz engine with EGR and muffler. The new roller was designed to provide easy access during maintenance and service of components. Access is gained from the ground, making maintenance fast and easy and reducing downtime. A variety of options help the machine closely match the needs of individual contractors.